Great Job, Milwaukee! We're kind of "fit"
In a tumultuous world of demented leaders and post-truth media, there’s some solace to be taken in the continued existence of MAD magazine. For more than 60 years, the satirical rag has been spoofing everything from pop culture to politics—much to the delight of snot-nosed 12-year-olds everywhere. Is MAD the sharpest satire around? Of course not (though Star Blecch III: The Search For Plot was a real hoot). Are the “usual gang of idiots” still performing an invaluable for future smart-asses of America? You bet your potrzebie. Anyway, MAD‘s February 2018 issue is available now (what, you don’t still have a subscription? ), and it boasts the return of the annual “20 dumbest” feature. President Trump (natch), white supremacists, Harvey Weinstein, and the blackballing of Colin Kaepernick are just a few of 2017’s dumb people, events, and things that MAD deliciously skewers. But look close at the feature’s Sgt. 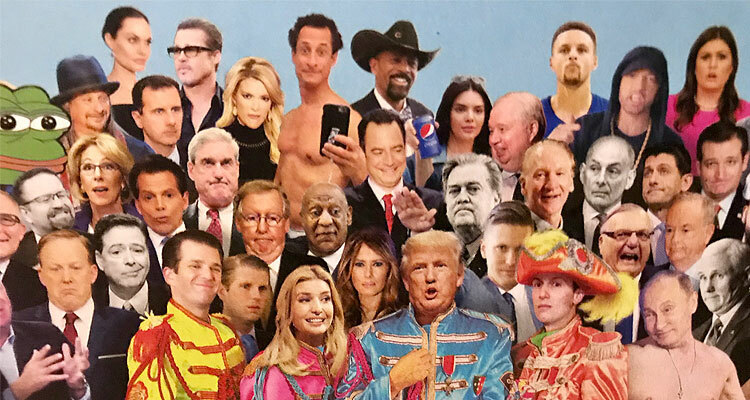 Pepper-spoofing intro and you’ll see a dumb thing that hits closer to home: former Milwaukee County Sheriff David A. Clarke Jr.
Yep, there he is, back row center, joining such dumb luminaries as Anthony Weiner, Steve Bannon, Sean Spicer, Kathy Griffin, Bill Cosby, shirtless Putin, and Pepe the Frog. (Tiki torches and fidget spinners also make appearances.) Sadly, Clarke—who quit his job back in August, but still retains his “tired troll” status going into 2018—isn’t roasted in-depth, but at least he’s there. And hey, there’s Paul Ryan! MAD #549 is on sale now for $5.99. Cheap!